Crop Factor : Size Matters? The Customize Windows > Computer and Internet > Digital Photography > Crop Factor : Size Matters? Crop Factor is one of the feature that is absolutely mysterious when you approach the world of digital photography. Digital photography (especially DSLR) is absolutely mysterious. You can find lengthy treatises on the meaning and implications of the crop factor. In this article, we will try to give a simple definition and understand enough to cut through. Reading the characteristics of the digital SLR cameras on the catalogs and reviews, you will certainly have to find something specified as crop factor which is 1.6X or 1.5X. What is Crop Factor ? As you may know, digital cameras use a sensor to record images. Depending on the make and model of the camera, the sensor size can be of different sizes. In contrast, in analog cameras, the negative has always the same size for one roll and model of camera, like 24 x 36 mm. To have a standard, even digital cameras consider this dimension as a reference. More expensive are the professional digital SLR cameras are, the sensor size is as large as the negative of an analog full frame camera. The cameras of lower categories have smaller sensors. Height and width of the sensor maintain the same proportion that have in full format (i.e. 4:3), but both are reduced in smaller size. 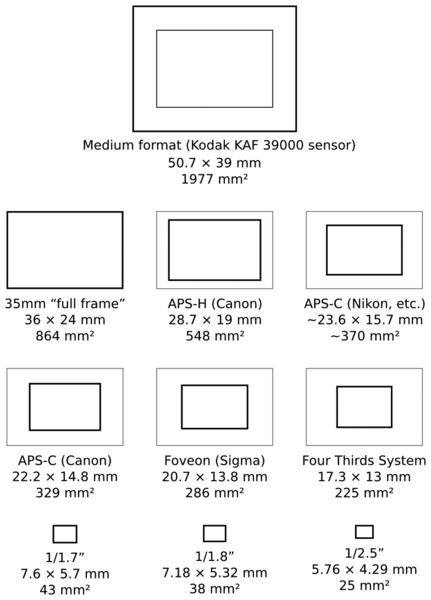 The relationship between the smaller size sensor and the size of the negative analog is said as crop factor. In other words, the crop factor is the value for which you have to multiply the size of a small sensor to get the sensor size of a DSLR. Some common values ? ?that the crop factor can take in the SLR are: 1.3 X in some models of Canon, 1.5X in Nikon and Pentax, 1.6 X in most Canon, 2.0 X in Olympus. This list is not comprehensive, but it covers a good portion of the most popular digital SLR cameras. What Effect Does the Crop Factor? When you take a picture with a sensor smaller than full-frame capture a portion of the image smaller. This equates to enlarge the image, to see it closer. Dwell on this concept, which is not immediate. In the picture below you can see the highlighted portions of the image captured by sensors of different sizes. So, if for example, we use a camera from Nikon that has crop factor of 1.5x, a photo that is taken at 50 mm will be enlarged as a photo taken at 75mm on a full frame digital SLR. Similarly a lens of 70-200 mm will be equivalent to a 105-300 mm lens on a full frame camera. Knowing the concept of crop factor and what is the value of the crop factor for the camera comes handy. It is not a criterion to be used to choose a camera rather than another (unless it is a full frame camera compared with a smaller sensor) camera. Rather, it is to keep in mind, when we have to choose which lens to use in a given situation. The exposure time required to avoid a blurred picture when we use focal lengths greater than 100 mm, considering the crop factor may make it difficult to take pictures correctly exposed dimly lit situations. We hope that we have explained this very clearly this time than we did before. Articles Related to Crop Factor : Size Matters? Title: Crop Factor : Size Matters? Cite this article as: Abhishek Ghosh, "Crop Factor : Size Matters?," in The Customize Windows, September 7, 2013, April 26, 2019, https://thecustomizewindows.com/2013/09/crop-factor-size-matters/.